• Routine diagnosis and care for the newborns who are in normal condition in order to identify any abnormalities or problems in adapting to a new life outside the uterus. 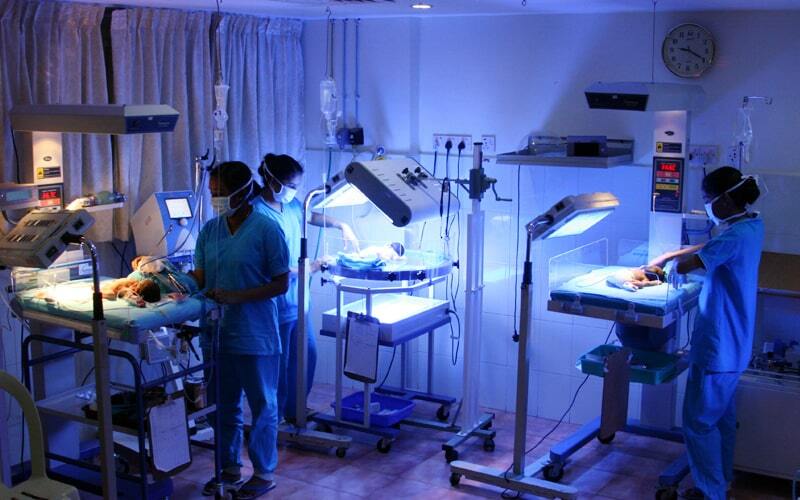 • Speciallized care for newborns with low birth weight, congenital abnormalities or other complications during birth. • To identify the newborn’s abnormalities and problems in adapting to life outside the uterus. • Quick examination of any respiratory problems or other anomalies. Resuscitation and or other immediate interventions are carried out quickly, if required. • Assess the health of the baby;s Central Nervous System and other reflexes. • To evaluate the gestational maturity of the newborn based on birth weight. If any anomalies of congenital malformation or problem with birth weight is noticed during the routine diagnosis, the newborn will be further examined by the appropriate specialist along with the neonatologist. Based on their examination, the newborn may be transferred to the Neonatal ICU for further observation, stabilization or treatment as required. The parents too will be apprised of the medical condition of the newborn and the proposed treatment plan in the NICU.